We left The Virgin Islands at about 11:00 AM after we said our last goodbyes to the Walch Family on Hotel California. We set up the spinnaker and had a nice downwind sail past St. John and St. Thomas. We were headed for a small island in the Spanish Virgin Islands called Culebrita. 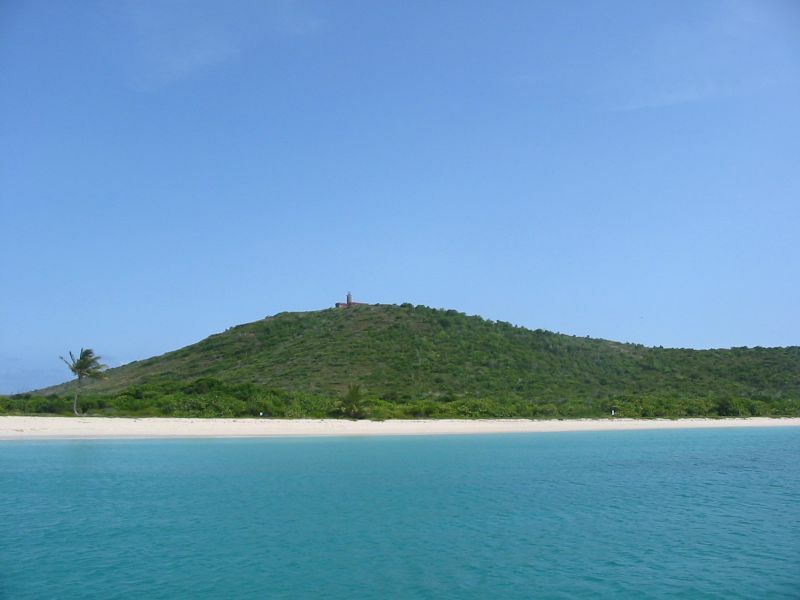 This is a small island next to its bigger sister Culebra both of which are part of Puerto Rico. 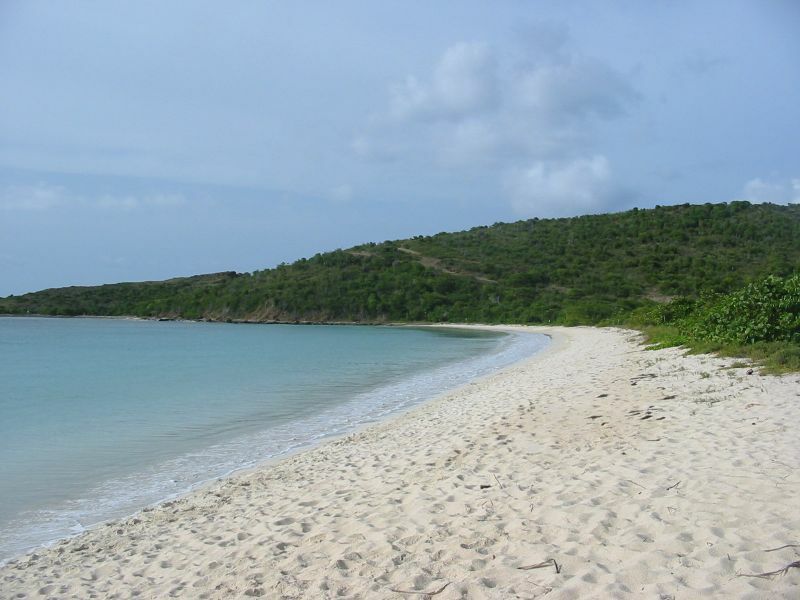 Culebrita is a National Wildlife Refuge, so it is has no residents on the island. This was a delightful island to visit! We decided to stay an extra day here. Before we got there, the waves were pretty big as we made our final apprach. As we were bringing down the spinnaker, the bows were as much as 15 feet above the water during some of the waves. But, we got it down safely if a bit wet. Along the way, Frank lost a big fish - I think it was a Wahoo from the fight it gave. We came into the official anchorage of Culebrita which includes plenty of free mooring balls. There were a couple of other boats at anchor, but they left before sunset, so we had the place to ourselves the first night. This bay was beautiful with a perfect white-sand beach lined with palm trees, and soft breaking waves. Catherine and Frank were quick to drop the dinghy and go ashore for a nice hike. We saw lots of bird life, hermit crabs on the trails, and beautiful views all around. 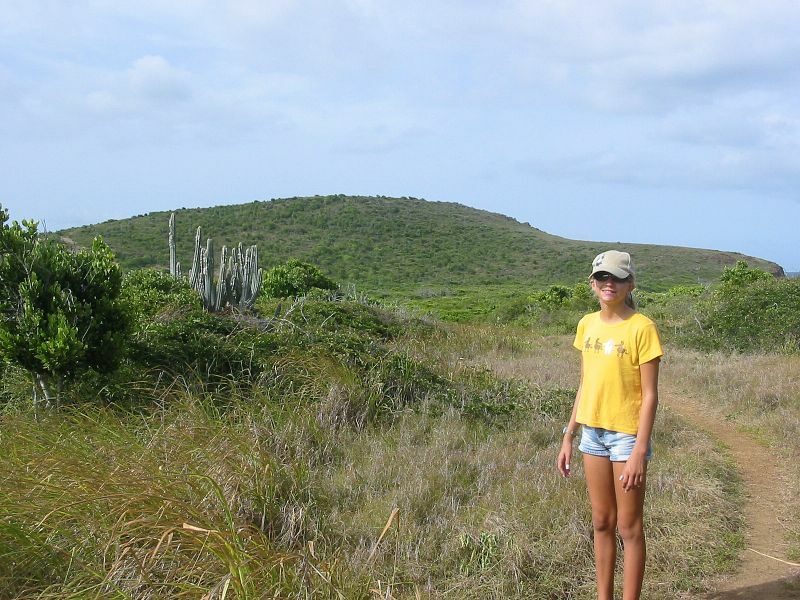 Here's some pictures of the beautiful Culebrita beach, Catherine on the hike, and PatiCat at its mooring. On the second day, Frank and Karen went for a snorkel and saw some nice elkhorn coral, lots of blue tangs and the other usual variety of fish. We also managed a bit of home schooling and watched a variety of small motor boats come in for a visit during the day. Karen and Frank went ashore for a sunset walk along the beach and to dangle our toes in the water. This sand was so soft you wouldn't believe it! 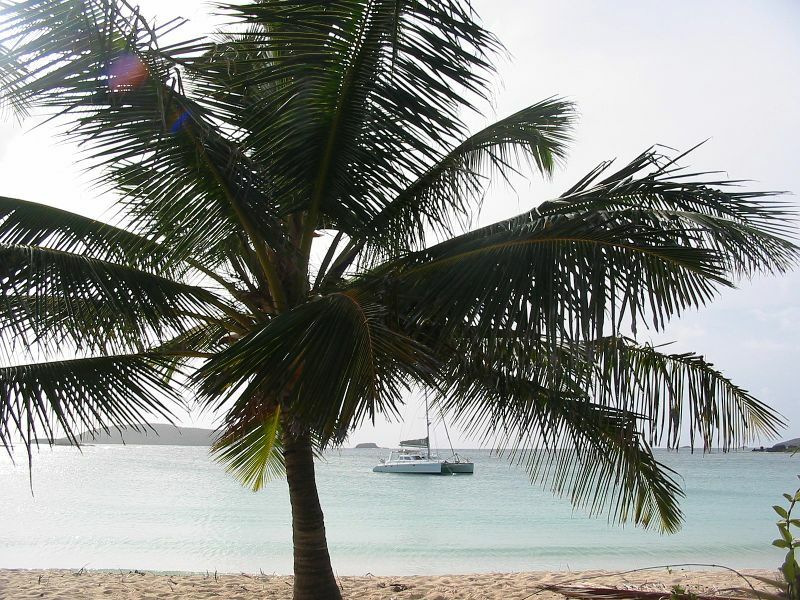 Culebrita is a must stop for those cruising these waters! 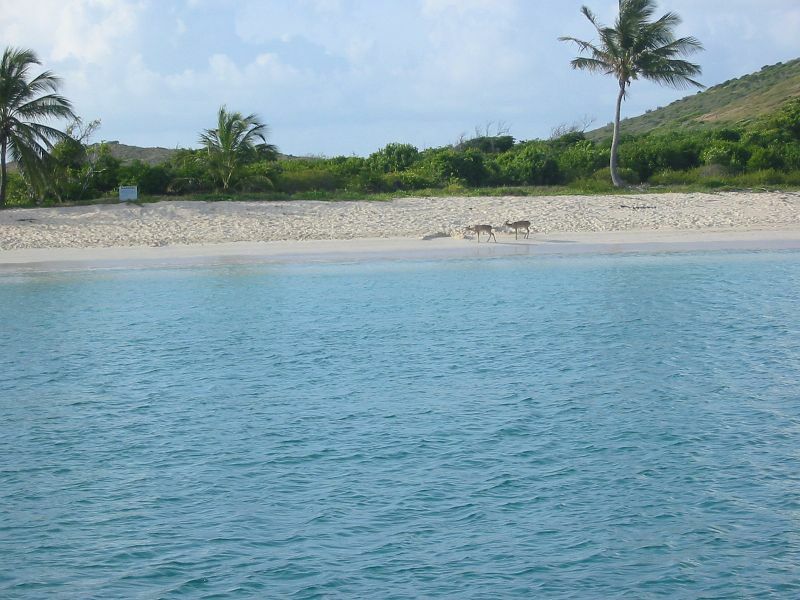 Here's a shot of the beach from on the beach, and the two deer. Early on June 11th, Frank and Karen saw some deer on the beach. Deer! We figured they may have swam over from the main Puerto Rico island. 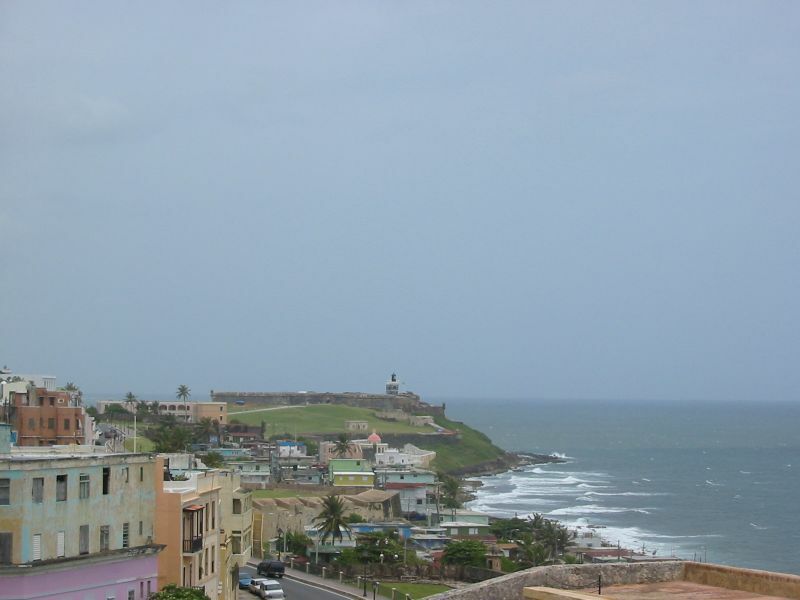 We left at about 7:30 AM to move to San Juan, Puerto Rico. As we were leaving we were visited by a lone dolphin - always a good sign. We attempted to use the spinnaker a few times, but ended up motoring at least half the six hours to San Juan. 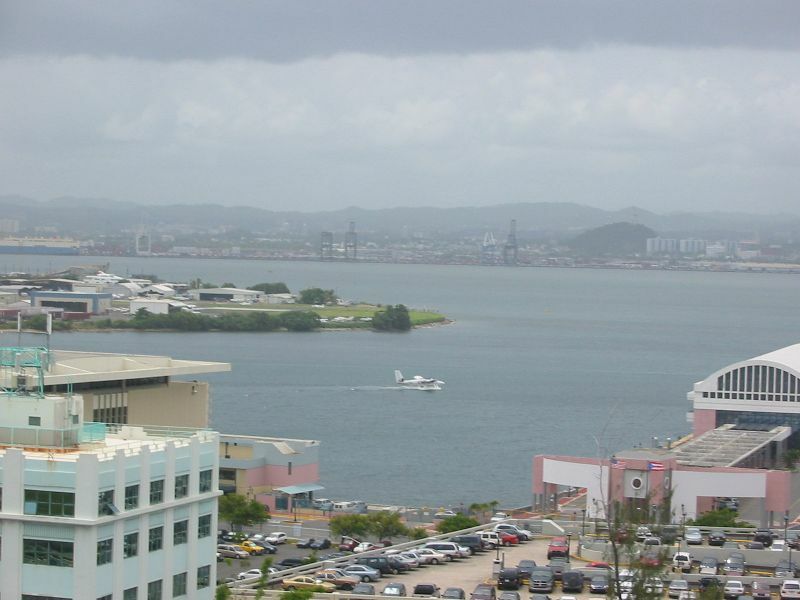 We arrived at the San Juan Bay Marina at 3:30 and they fortunately had a slip we could fit into. 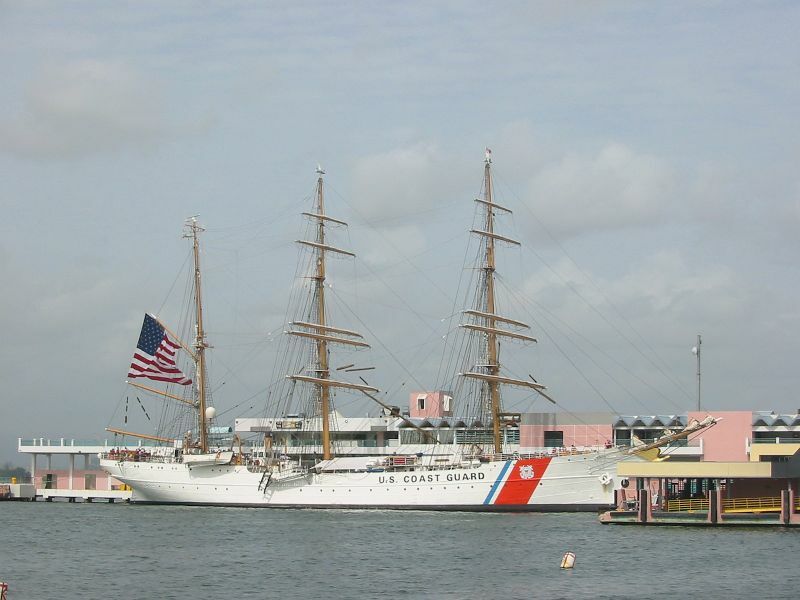 Frank and Karen had previously visited this marina during our trip to San Juan last year. Entering customs was a simple over-the-phone process. We got situated at the marina and we all took showers. We then went to a Sizzler restaurant nearby and enjoyed American-style food. Yum! We reviewed our options and decided to rent a car so we could see some sights in Puerto Rico over the next few days. We picked up a rental car the next day and drove to Old San Juan. 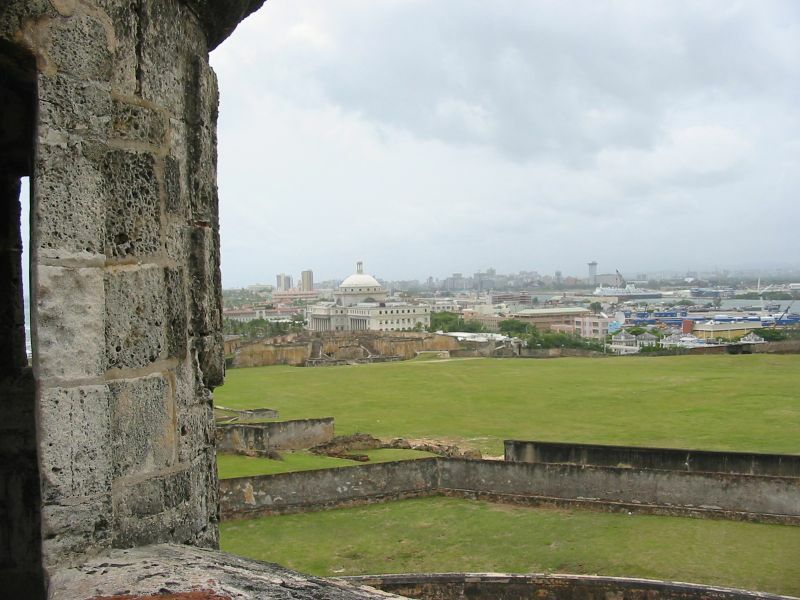 We first went to Castillo de San Cristobal and had a good time visiting the castle and museum exhibits. Next we had some lunch and then we went to an Internet Cafe and Frank synched up E-mail and web pages. Based on the weather forecast, it looked like we would need to leave a day or so earlier - on Saturday. So, we adjusted our tour plans accordingly. 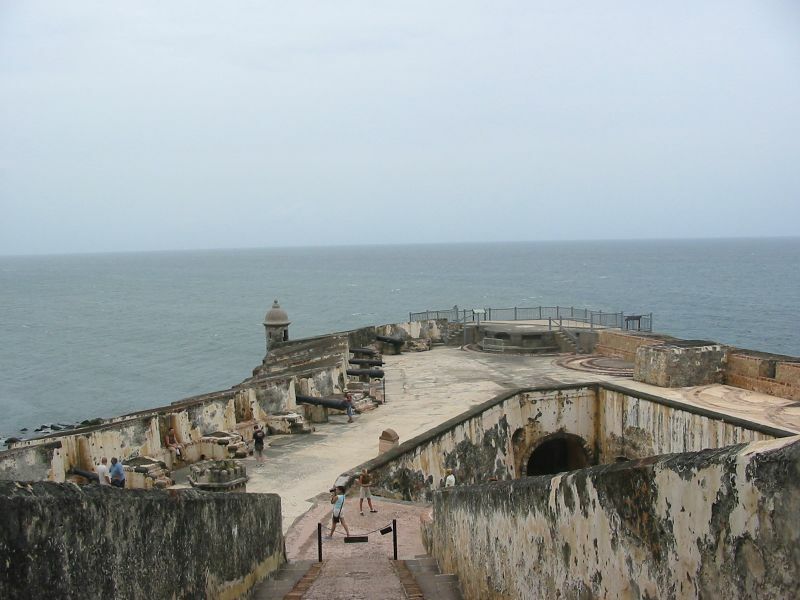 In the afternoon we went to El Morrow, the big fort on the corner of the port entrance. We had a great time visiting this fort. One of the highlights was watching a ship leaving the port with several dolphins making huge jumps off the bow wave. It was so beautiful we forgot to take pictures...sigh. We all enjoyed exploring this fort and the sights of the rocky beaches with the deep Atlantic ocean's waves crashing in the air. 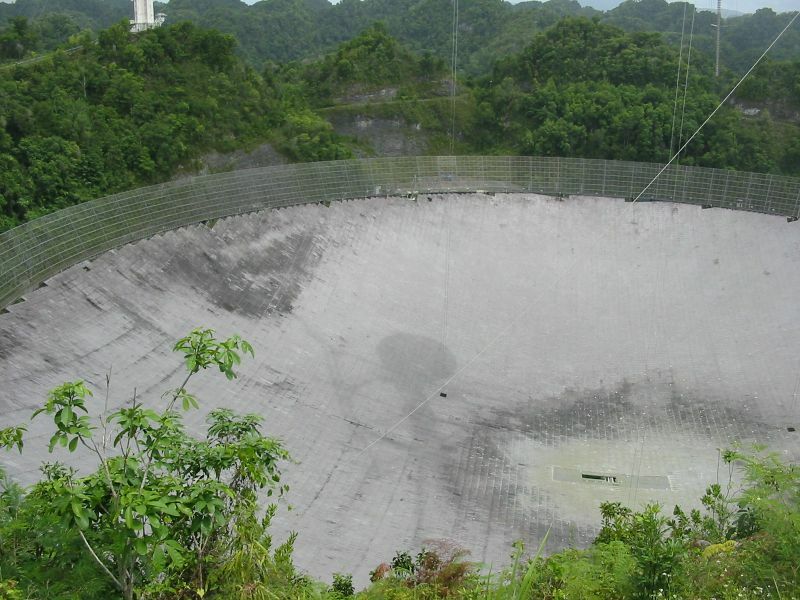 The next day we eventually left to drive to see Aerocibo - the largest Radio Telescope (still) in the world. The famous one you see in the movie "Cosmos" with Jodie Foster, or in X-Files or any of a number of other shows. Interestingly, the highway required at least 5 toll booths to get to Aerocibo. That was frustrating. But, it turned out we were lucky we were so slow because Aerocibo didn't open to the public until 12:00. It was 11:30, so we decided to go to the tourist restaurant nearby. We had a nice lunch, and finally got to into the Aerocibo facility. A long walk up the hill was needed to get to the museum. It is set up so you have to go through the museum before you can see the telescope. We decided to see the view first, and then come back and go through the museum. Wow, what a view! After looking and taking some pictures, we all spent a while looking at the exhibits. 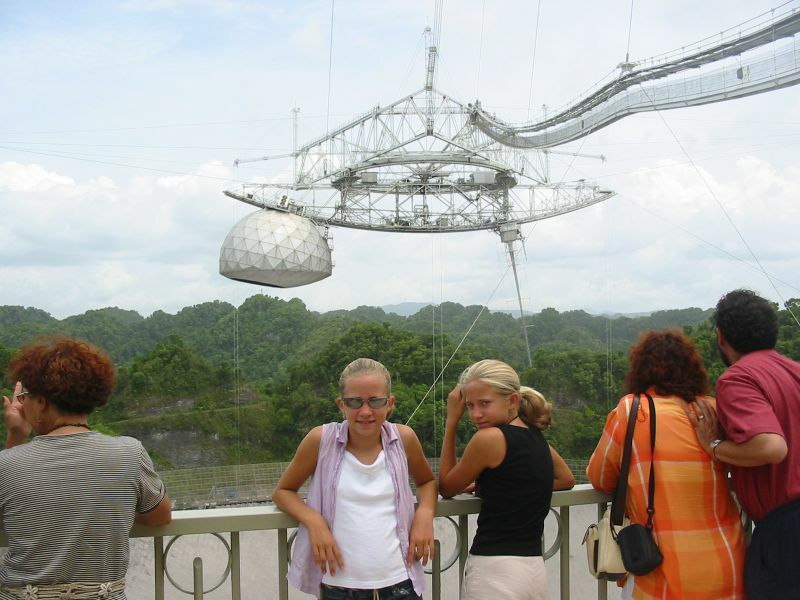 The girls really seemed to enjoy learning more about astronomy - they must take after their father. We finally got back to San Juan late in the day. Frank had to go back to the Internet cafe as he had forgotten his power cord the day before. Fortunately, someone happened to be in the store because the store wasn't open due to a holiday of some sort. That was lucky because we planned to leave the next day. Next we went to shop at a big American-style grocery store. The next legs were going to be a lot of sailing with few good places to shop. From Puerto Rico to Florida stopping some while going through the Bahamas. On Saturday morning, June 14th, Frank first returned the rental car. We got the boat fueled up. and Frank did a quick rinse of the boat while we had free water. 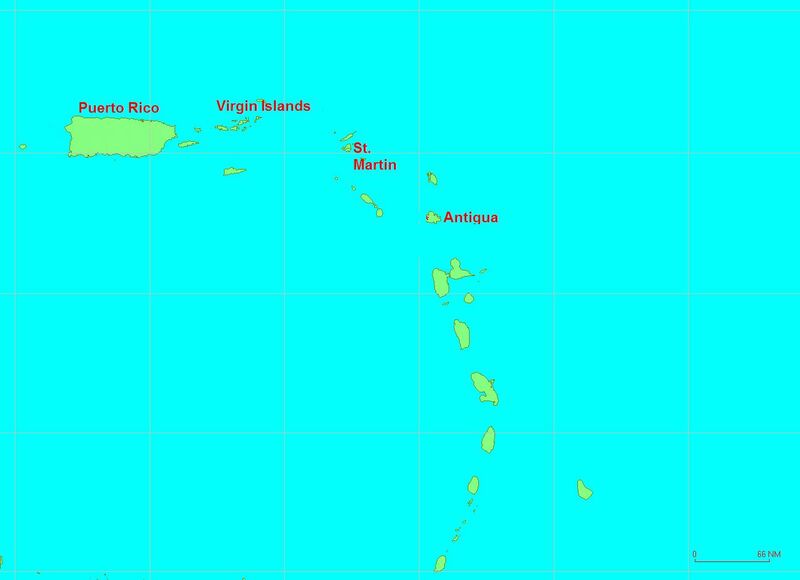 We then checked out of the marina and departed for the long trip across the deepest waters of the Atlantic (the Puerto Rico Rift is 30,000 feet deep) toward the Turks and Caicos and the Bahamas. © Copyright 2003-2008 by Frank Taylor. All rights reserved.